The Democratic National Committee's latest fundraising numbers show the party continues to have trouble with fundraising as the 2018 midterm elections approach. April 2018 marked the DNC's worst April of fundraising in a midterm election year since 2006, according to data filed with the Federal Election Commission. While the DNC raised only $7.9 million in April 2018, the Republican National Committee raised $13 million. April's numbers brought the RNC's totals to $43.8 million cash-on-hand and no debt, while the DNC's totals came to $8.7 million cash-on-hand and $5.3 million of debt. Some of the money recently spent by the DNC went to Onward Together, a group led by former Secretary of State Hillary Clinton, after it bought the group's contact lists. Democrats' fundraising woes come as they try to take the majority in both the House of Representatives and the Senate. That goal is particularly challenging in the Senate, where Democrats will be defending several seats in states President Donald Trump won in 2016. 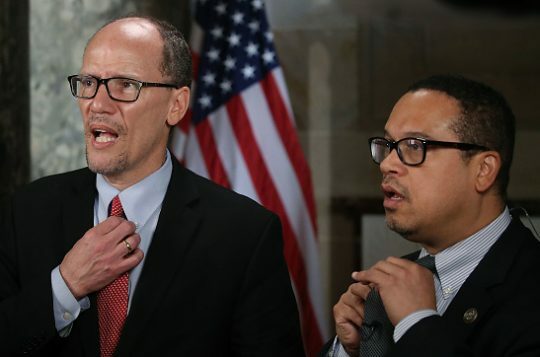 DNC Chair Tom Perez remains optimistic Democrats will take the majority in Congress despite the party's lack of funds, funds that have only diminished since he took the helm at the DNC in February 2017. This entry was posted in Politics and tagged 2018 Election, DNC, Fundraiser, Midterms. Bookmark the permalink.